Twenty-Odd Ducks: Why, every punctuation mark counts! is a fantastic resource to teach students how the placement of a punctuation mark can alter the meaning of a sentence. The author demonstrates this by modeling two different sentences and color coding the different punctuation. The illustrations aid the reader in understanding the difference between the two sentences. The Girl’s Like Spaghetti: Why, You Can’t Manage without Apostrophes! Lesson idea: Read aloud this book and/or the additional books in the series. Point out how the punctuation changes the meaning of the sentence. Discuss the pictures and how the pictures show different meaning as well. When children are familiar with specific punctuation marks and their uses, have each student write two sentences that use the same punctuation marks differently and illustrate each sentence. Bind each child’s work together into a class punctuation resource book. If you are looking for additional resources and ways to teach conventions to students, please read the post I wrote about Punctuation Celebration or the post I wrote on The web files . **Note** I provide these lesson ideas under the assumption that you are familiar with The Six Traits of Writing. If you are not, and would like more information about teaching students about conventions or any other six traits component, please feel free to contact me at Dlittle[at]linkstoliteracy[dot]com. I am happy to provide more specific lessons or resources if necessary. Ha! So, I thought I could quickly remodel my blog with no problems at all! I’m hoping to get things back up and running tonight! Please bear with these changes until then. Literacy Lava 2 Now Available at The Book Chook! Hi all! Here is a special post about a special product! 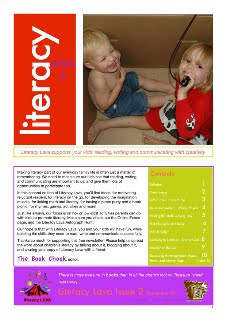 Literacy Lava is a free pdf ezine for parents, offering tips on ways to incorporate reading, writing, and communicating into family life. Brought to you by bloggers and writers who are passionate about children’s literature and literacy. Literacy Lava 2 is erupting with no- or low-cost activities parents can do with their kids. So, if you think you’d like a little lava to read with your java. . . If the price tag FREE appeals to you. . .